Finally found one that's durable, convenient and practical. I love this canopy, it's big yet not taking to much space. Made of durable materials will last forever. Recommended to anyone. This elegant and fully-adjustable sun shade is perfect for protecting you from the harmful glare of the noonday sun. Featuring a stable base, and the highest-quality mechanisms attached to water-resistant fabrics, this piece will last for years and years, allowing you to enjoy the outdoors while sheltering friends and family from the elements. This umbrella is beautiful. The color is definitely not a sand color but more of a grey color and wasn’t what i was expecting. I still kept it because i needed it for an event I was having. It came pretty fast! I’ve used it for 3 months and the umbrella has cracked right off while in a closed state. Looks high quality but actually isn’t. Not very happy that the umbrella didn’t last even one full season. The umbrella arrived today without the base, of course after reading other reviews, I guess this is normal?? I did contact Overstock right away asking if they knew the base was being delivered separately or if it was just missing. Their response was that they can’t send a replacement base as they are now sold out and that they started a return. So I’m not sure if the base is coming or not. I guess I will wait 2-3 days to see if it arrives, which is aggravating since I ordered this for a 4th of July party. The umbrella was easy to assemble and is huge! The fabric is lovely and will withstand the outdoors nicely. Nice for price. But I’m not sure it will last more than one summer. 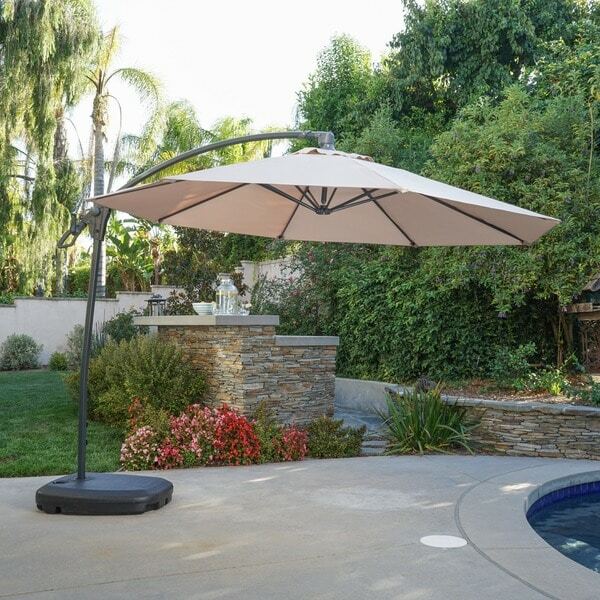 This is a great patio umbrella. High quality, large size, very steady due to a large base. Gives a great amount of shade. Looks just like a picture. It came in two separate boxes, 24 hours apart- i was not aware of that at the time, so I panicked a little, but overall the package came earlier then what was estimated on the order . The price was a wonderful surprise, you really get a quality item for a good, reasonable price. Very, very happy with this umbrella. Highly recommend it. The material of the umbrella is very sturdy and fade resistant. All umbrellas should be made of this material. The umbrella moves a lot on windy days so sometimes it cannot be used. Easy to put together. This is a perfect add for the patio furniture we purchased. Now we are protected from sun and rain. I wish I knew about this canopy before..much more convenient than the pole that is inserted in the middle of the table. Seem like a good umbrella, ask me after a few months. Was skeptical at first, wasn’t sure if this was going to be a great quality because it was so much less expensive than others available! This is a great buy for the price point. Very happy. Now that we’ve put it up, we can’t really put it down. Mechanism is not good. Large canopy. Easy to put together. I have been looking for an umbrella for a long time and this one had remarkable reviews. I am hoping to love this product! "Do I fill the base with water?" "What is the base made out of and how much does it weigh."